I was going to spend a week in Nelson, taking a return flight to Castlegar (mid way between Calgary and Vancouver); then return to Vancouver where the Whistler Shuttle (who guarantee that from Vancouver Airport you’ll be on your way within the hour of landing), would not only take me to Whistler, but would drop me off at my accommodation door. “Calling all passengers on flight AC8248 to Castlegar. We are now boarding through Gate 4. It’s not often you hear a flight called where the destination is potentially the same as its departure. But I love a sprinkling of serendipity when travelling so embarked the plane with an air of anticipation. As it developed, the flight was smooth, beautiful, and fruitful. We floated over snow capped mountains and deep deep valleys where those rogue clouds looked like sticky candy floss. 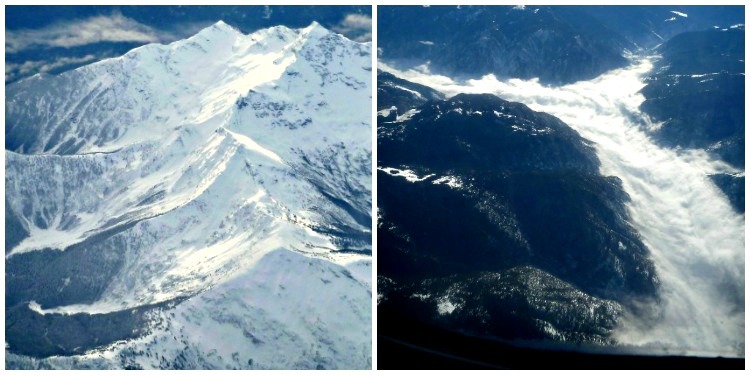 Our destination – Castlegar – is considered to have one of the most challenging approaches of any North American commercial airport with ‘no possibility of a straight-in approach’ due to the surrounding mountains. So it was a relief, as we started our approach that the candy floss clouds dissolved and our final descent down the narrow valley (where you could virtually touch the passing tree tops on either side) brought us in so as to turn on cue to miss the mountain range that lay perpendicularly ahead of us. 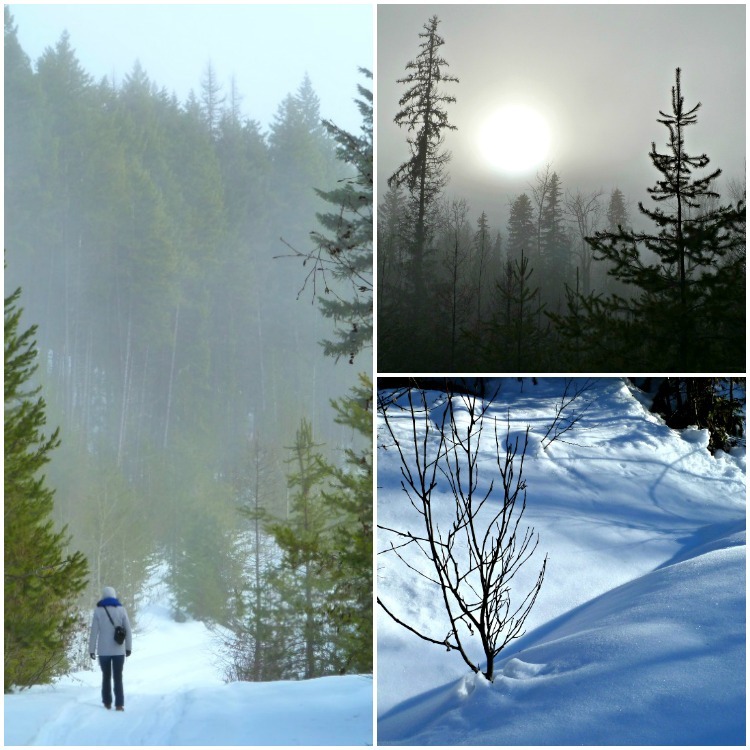 After a superb week in Nelson (blog posts of fat tire biking and snow-shoeing at Whitewater to follow) I was ready to leave Castlegar, which I had discovered during my stay was colloquially referred to as ‘CANCELgar’. I arrived at the small airport at 9am to the announcement that not only was my flight cancelled, but flights from the previous two days had also been cancelled due to poor visibility; while there was another flight due at 1pm, with the previous two days’ record, I had to ask myself – was it really that promising? There was a single daily Greyhound bus that (miraculously?) left in less than an hour but would take 12 hours, compared to the flip of a coin possibility that the lunchtime plane, scheduled to take just an hour may (or may not) jet in. I vied for the “certainty” of the Greyhound – at least that way (so I thought)… I’d be at my destination by nightfall. A cab was called, and I raced to the Greyhound office to purchase my one-way ticket. 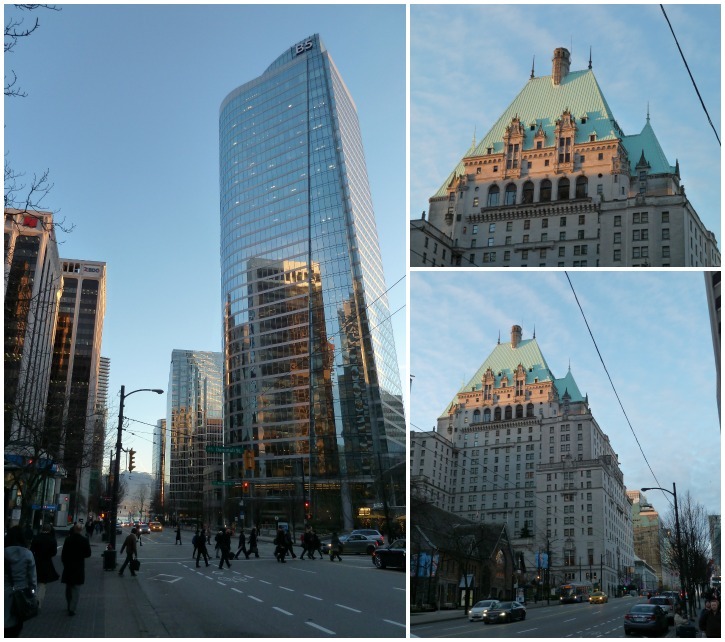 And two hours into the 12-hour trip to Vancouver it lived up to its appearance. Making our way up a mountainous pass the bus ground to a halt on a steep single lane incline. After a few intermittent bunny hop efforts of cranking her up, and letting her cool down, we reached a safer spot to pull off the Highway and assess the situation – Which was that we weren’t going to be going anywhere soon – And… we were out of cell phone range. A while later a reconnaissance party from the last base appeared through the fog to do a first hand reconnoiter. The reconnaissance team got back into their cosy 4WD and returned to base with the update. A group of unconnected people suddenly finding themselves connected by a common event. A man who related how his wife was on her death bed so was desperate to get to her side, managed to muster another three passengers (prepared to fork out the additional $125 each to share a taxi) and so passed ‘Go’ and moved on to the next stop. “You take it – I’ll follow in the next one”. He returned to the bus alone. A mother with two children, rugged them up against the cold and got off for some playtime in the snow. A couple of young women asked the driver how long we’d be here? On the assumption the replacement bus would come from a base further up the track (after the reconnaissance team relayed the request from the base further down the track) he estimated “at least a few hours”. They descended the steps and headed off into the woodland to explore the snowy forest footpaths. 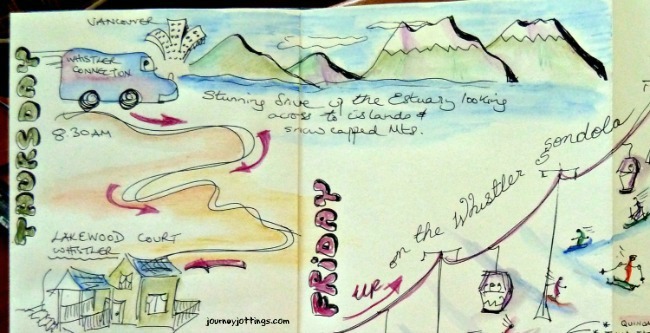 I updated my travel journal. Then, rather than stay cooped up, I too took to the woods following the snowy footprints of other destitute passengers who had gone before. It was otherwise a silent, uninhabited landscape. It felt a little ominous. There was a low lying murky mist – the sticky candy floss clouds seen from a different perspective – wafting through the dark conifers blocking the sun from fully penetrating. But as the path rose higher, I emerged out into a sparkling fresh white landscape a world away from the gloomy reality sealed in below. 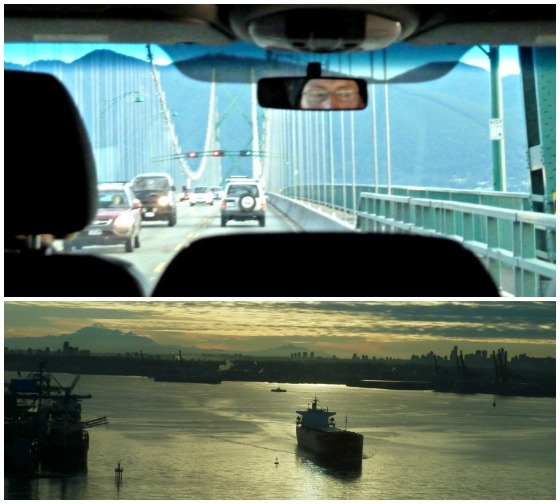 Three hours later, the summoned replacement vehicle appeared over the horizon, and after five hours marooned on the side of the highway, the journey continued on to Kelowna. Where, as a consolation for the endured inconvenience Greyhound offered us all a plate of the greasiest noodles flecked with khaki coloured tinned peas and ochre coloured corn kernels, with a bottle of water. 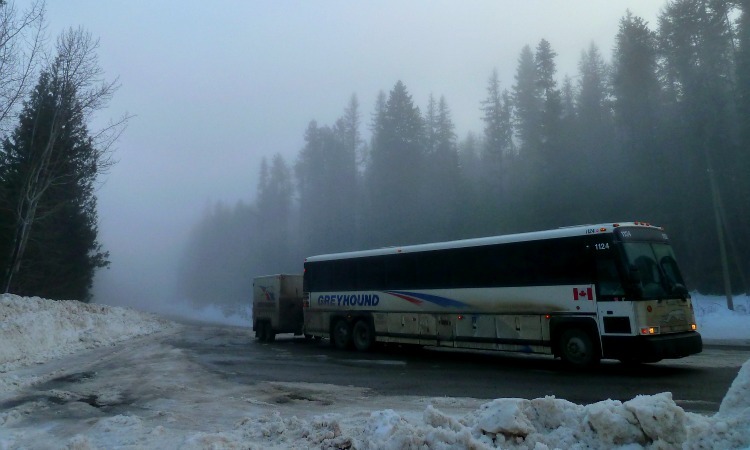 At 10 pm – the time we were supposed to be arriving at our destination, we were instead boarding our ‘connecting’ bus to take us through the night to Vancouver. The driver stopped, and came back to inspect the problem. 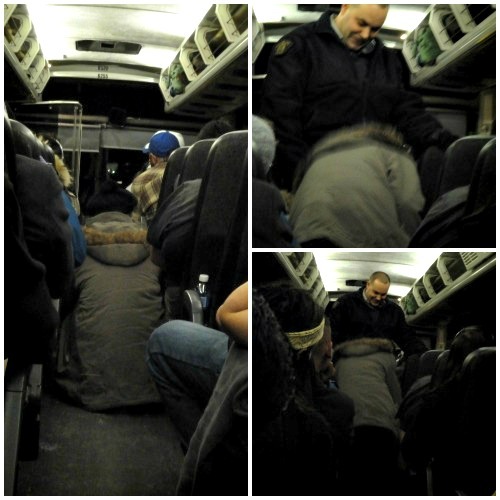 The man agreed to move himself further up the bus, but then took to sitting in the middle of the aisle. The driver donned his regulation fluoro yellow safety vest and called the Police. We waited (and waited) for them to respond. Still protesting his innocence, the Police cordially escorted the perpetrator off the bus. The motor once again droned. Fleeting glimpses of lit up settlements flashed past. I whiled away the wee hours of the night with occasional head nodding and much leg twitching as my feet ferreted around under the seat in front trying to find an illusive horizontal position that all diurnal creatures crave when forced to sit bolt upright past midnight. It was still dark when we finally pulled into the Greyhound station at Vancouver. As the dawn began to break I hailed a yellow taxi cab and headed down town to a newly appointed shuttle-bus pick up point (as I wasn’t going to be at the airport as I’d said). In the hotel foyer, a Starbucks was serving aromatic cups of coffee to the early morning city slickers; some rushing to their office, some holding breakfast meetings and some donned in tight fitting running gear with white ear plugs draped around their necks grabbing a caffeine boost as part of their latest health kick. I sunk into a plush low level sofa and relished the comfort of a delicious drink and a palatable plate of food. 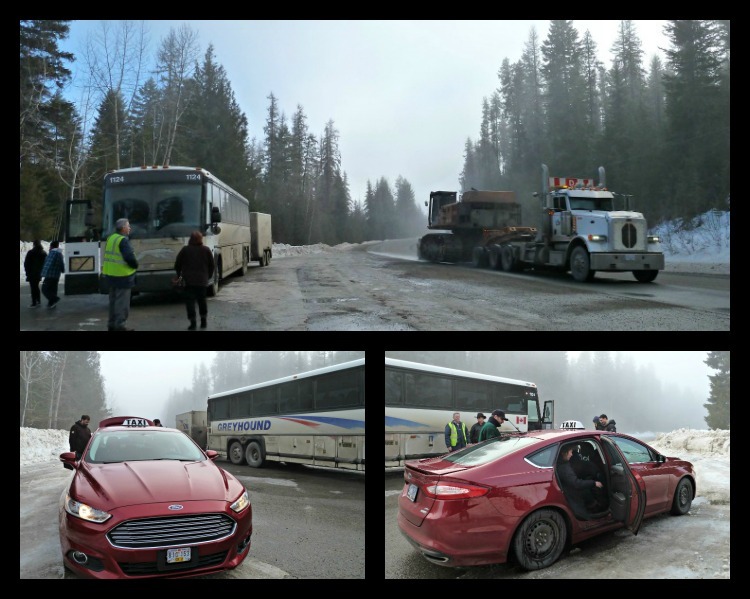 My Whistler Shuttle Bus pulled in on cue – appearing like a knight in shining armour the driver rescued me from my 24 hour ordeal. Skipping the early morning rush hour traffic we were out and over the bridge in a flash and heading up the Sea to Sky Highway 99. The scenery of Howe Sound was positively dreamy – With tantalizing views across the water to distant snowy mountain tops – my destination. 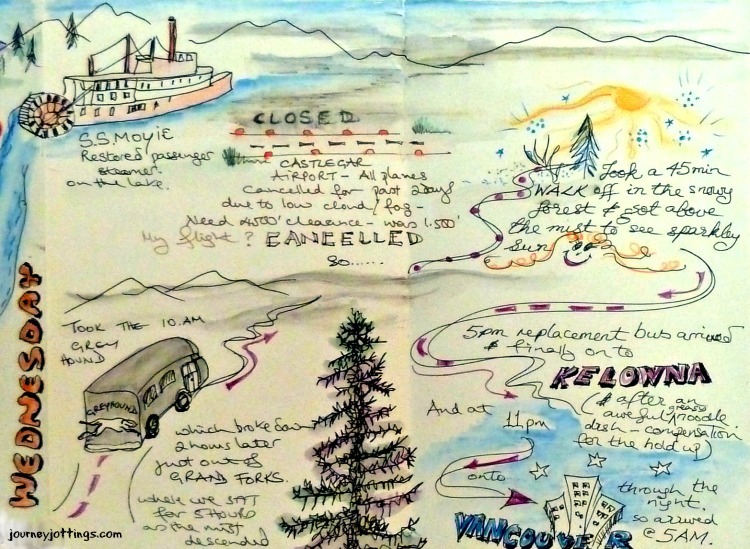 Have you had a simple journey turn into a convoluted adventure? 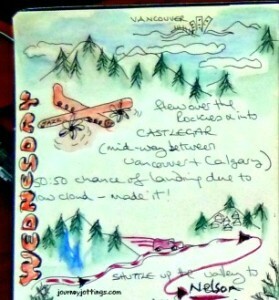 This entry was posted in Postcards from Canada, Tales of a Traveller and tagged British Columbia, Canada, Ridebooker, Vancouver, Whistler, Whistler Shuttle by Linda. Bookmark the permalink. We have often pondered why Greyhound buses in the United States look like rolling trash dumps in comparison to those we’ve traveled in Mexico, Spain, France, Greece (you get the picture) — sparkling clean Mercedes vehicles. And the passengers. . .well, you’ve experienced them now and I can assure you we have much the same just an hour and a half south of that Canadian border. You have taken the approach I always tell myself to do and that is, “Oh well, it will make for a good blog post if nothing else!” Glad you saw some beautiful scenery and now understand why the Pacific Northwest is called “rugged” — it isn’t always the terrain! OMG – all that AND the cold!! 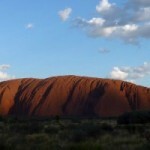 At least most of my more dramatic Aussie Adventures haven’t required my body weight in clothes!!! 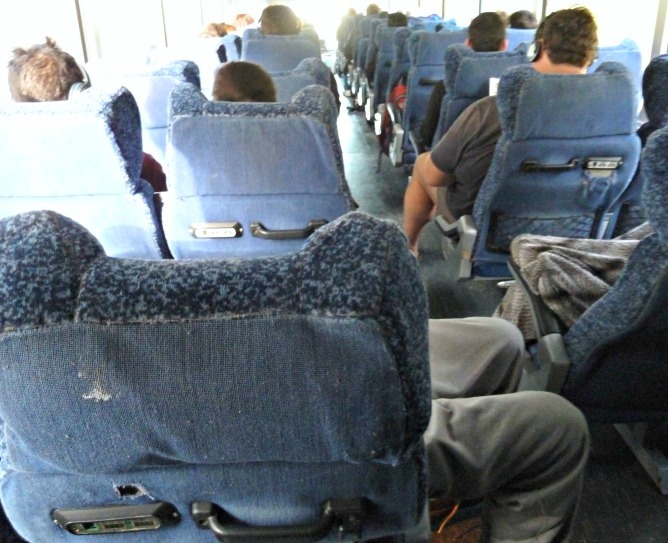 It’s been a long time since I travelled by bus – but the last time was a 6 hour trip after a car fail at tiny South Aussie town Glendambo. Wait! I suspect there’s a common theme here – we only think about catching the bus when the our preferred modes of transport fail??!! 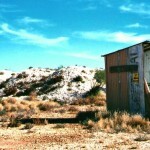 Well that sounds like a hideous journey – but a great travel story! Still not sure why you stopped in Cancelgar though – I hope it was worth it – and can’t wait to see what you got up to in Whistler. Whistler which is a resort first and foremost. Sorry Linda, but I laughed as I read this. It is good to know that this also happens to other people. I am sure my jottings may have been getting darker and darker. I should have done this when we got stuck on the bullet train for 10 hours in Japan. At least we knew we were there for the long haul – Having to stand on a crowded bullet train not knowing when it was going to go – or not daring to leave in case it took off without you I think sounds even worse! Oh dear. But, as someone said, bad experiences make for good blog posts. I’m not sure I’ve ever had a travel day quite that bad (unless I’m blocking it from my mind to protect my psyche). My last 40 hour travel day was totally self-inflicted since I planned the itinerary myself—Philadelphia, PA, USA to Chiang Mai in northern Thailand in one 40 hour day. Then there’s the question of why you traded an Australian summer for a Canadian winter although I admit the virgin snow looked lovely—without the windchill. Silver lining: It’s better to have a sociopath on a bus where they can pull over and call the police than on a plane in the middle of an ocean at 38,000 feet. Oh Suzanne – That’s a chilling thought – I may have to block that from my mind to protect my psyche if I’m ever to fly again! That was certainly an experience Linda and one you wouldn’t want repeated! Did you ever check to see if the flight left that day? Whistler is such a beautiful place that I’m sure that, after a recovery day, you may not thought of that day again until it came to writing this blog post! 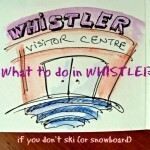 I look forward to your stories on Whistler! NO!! It didn’t fly, so I certainly would have not been there any sooner! Phew!! Wow, what a nightmare. It’s usually looney tune passengers who’ve taken leave of their sense of appropriate behavior that will get me going. It sounds like folks were in no mood to indulge them. Glad you could pick bits of humor and serenity out of a very trying situation. Funny how what was supposed to be a one hour flight turned into a 24-hour adventure! Well you took the long way to Whistler but you made it! It makes for a good blog post at least. I bet you enjoyed your week in Whistler too! Oh my, I’m glad I wasn’t on that bus! I did enjoy the SAS man whose clever plan ridded you all of a pest. I second that Carole. Good thing I’m not on it, but I really had a great time reading the blog. Hilarious!! Obviously not for you at the time, but definitely for me reading it! 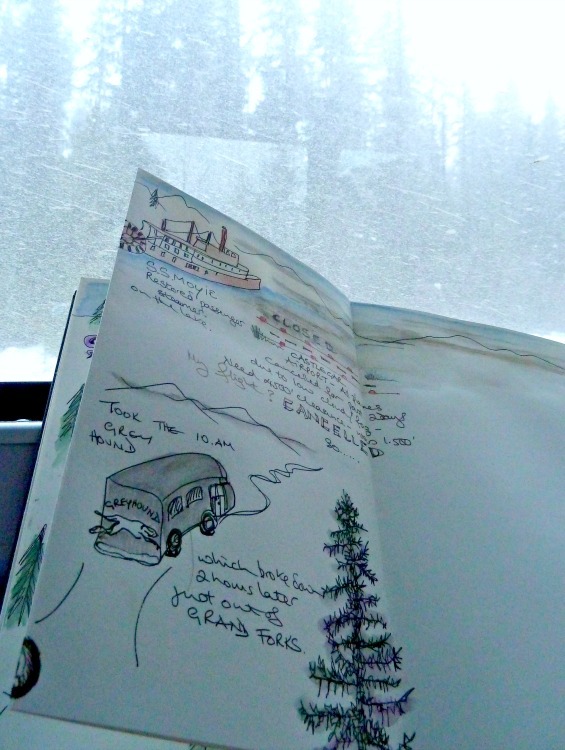 To think that so many adventures could happen on one unintended bus trip (love the guy who wouldn’t move from sitting in the aisle until the police came!!). I too was keen to know if that plane had taken off so glad to see your answer that it hadn’t. So it was all worthwhile plus a great blog post to boot! Oh dear!!! But with a little tweaking this could really make a great Monty Python script. I particularly liked the SAS man’s nifty way of ridding your world of the loudmouth! He probably felt like taking him into the woods… just kidding! So glad you eventually made it to Whistler, and in a reasonably good mood! If I’m travelling Yasha – I’m always in a good mood! What an ordeal. I can imagine starting to feel like an episode of Lost. I’ve driven through Castlegar, but didn’t know it had such a challenging airport. I’m interested in knowing why you choose to make this trip in winter? For the skiing? Wow! Now that’s a travel story. It’s so funny, I think as bloggers the minute something out of the ordinary happens in our travels we think, “Is this a blog post moment?” So glad you arrived safely! Having a one hour flight turn into a 24 hour ordeal, I think has made it into a trip that will take some beating when it comes to convolutions! That sounds like one of the most harrowing journeys ever! Sometimes. half the fun is getting there! It was certainly one of those trips where one scenario flipped the events into another unexpected scenario until the single cancelled one hour flight spiraled out into a 24 hour journey! I’ve had some convoluted journeys, but wouldn’t dare to write them here after reading about yours — I think they pale in comparison. As entertaining as this was to read, I can imagine what a drag it was to experience it. But you made the best of it which made it possible for us to enjoy your photos, video, and wonderful jottings! What a crazy journey but it’s so beautiful up there I’m sure you felt it was worth it in the end. I used greyhhound in December while traveling in US last year. I traveled from Washington to NY. Actually I was surprised how clean and well organized it was. I am European and I heard all sort of bad stories about using buses in US but that was actually quite pleasant journey. I love your drawings Linda! They’re beautiful, and really add to the story! What a journey. Sometimes, the best posts are the bad journeys. I have done few trips like that and still laugh when I recall them. I very much enjoyed reading your story.